Williams Infusion, LLC founded in 2005 manufacturers composite parts with the mission to use technology to build high quality composite parts. With the use of Resin Infusion technology, we are able to build lighter, stronger, more durable parts. We continually research and improve techniques to provide the highest quality parts available. We work with customers throughout the design to manufacturing cycle to insure all customers are satisfied with the final product. 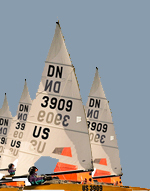 Our current projects include: DN ice-boat spars, and Ice-Optimist for youth sailors. Contact Williams Infusion, LLC for your composite manufacturing needs. Our mission is to use technology to build high quality composite parts that meet or exceed our customer’s expectations and to build good customer relations thru hard work, integrity, and good will.